This is my favorite month of the year, I love the changing of seasons, and the beautiful colors of fall. To celebrate I designed a free pattern for my Craftsy shop - Drifting Leaves. I always wonder how many people actually take time to make these blocks - so I was really excited to see what one of my fellow Quiltsy team members on Etsy made with my block! Donna of Lawson Creations did a beautiful job of making a fun table topper with the block pattern. I was delighted that she gave me credit as well - it's always nice to be acknowledged. 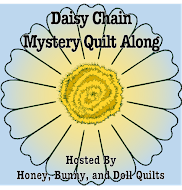 She has lots of fun and affordable quilts in her shop - make sure you check it out! I think designing block and quilt patterns is one of my favorite quilting activities. This particular block is definitely one I want to make into a quit. 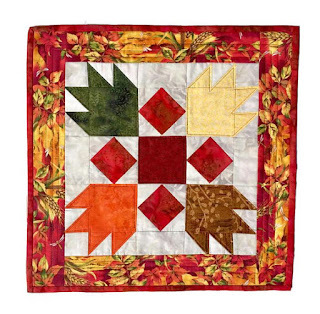 I think it will be fun to use lots of fall colors for the leaves and use the same red fabrics in each block to make a scrappy quilt. Hopefully I can find time to work on some blocks before the fall inspiration fades for the year! Do you like making seasonal quilts, too? If you want to make this block, be sure to get the free download this month - I'll be changing it next month, so you only have one more week!